On Tuesday, March 18th (or in exactly 5 days), one of the debut YA novelist’s books that I’ve been looking forward to will be out in the wild on book store shelves across North America. It’s called Side Effects May Vary, was written by Julie Murphy, and is being published by Brazer + Bray, an imprint of Harper Collins. In order to celebrate this novel’s release, the author asked for people to create and post a bucket list on their website, and today, it’s my chance to share some of the things I’ve accomplished, some of the things I hope to accomplish before I kick the proverbial bucket, and those things I hope to continue doing every day for as long as there is a bucket left to kick. 1. Visit a rain forest. 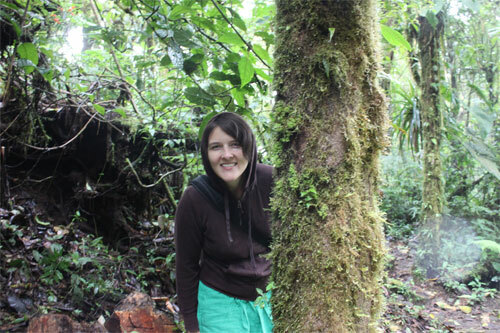 Melissa is peeking around a tree at Santa Elena Cloud Forest Reserve. As someone who has always been interested in environmentalism, I’d decided a long time ago that I wanted, at some point, to visit a rainforest. In 2011, when my boyfriend and I travelled throughout Costa Rica, I had the chance to visit and hike through the Santa Elena Cloud Forest Reserve. I had never seen so much life before or since – even where a tree had died and fallen in the forest, other plant species would begin growing on the dead, organic material. So incredible. 2. Travel to at least one place in every continent. This is a work in progress. So far, I’ve travelled to a several cities in North America, four cities in four European countries, five cities in Central America, and four cities in two Asian countries. 3. Learn to speak Spanish and Italian. I speak and write English fluently, and je parle et j’écris le français à un niveau intermédiaire, but I’ve always wanted to learn more. After returning from Costa Rica, I began taking a Spanish language course to prepare for further travel, but I need to get back into it to become more confident. As for Italian, well, with a family name like Montovani, it’s almost sacrilegious that I can’t speak the language. Truth be told, I come by it honestly – my father never learned to speak it from his father – but I would love to learn because it always seemed to be missing from who I am. The scarf Melissa knitted for her boyfriend, John. It has been completed since this photo was taken. When I was a child my Nana taught me how to do the knit stitch, but nothing else, and it wasn’t a lasting hobby for me. However, when one of my cousins announced that she was expecting her first child in the spring of 2014, I wanted to pick it up again. 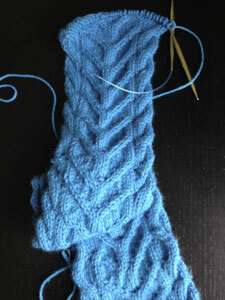 My sister taught me how to cast-on and reminded me how to do the stockinette stitch in December of 2013, and with the help of YouTube, I taught myself how to purl and create cable patterns. I still make some mistakes, but am happy to say that I’ve made two infant-sized hats, an adult-sized scarf, have two other projects on the go, and others planned. While I’ve lived in several towns and cities in Canada, I’ve never lived somewhere else. Maybe it’ll have to wait until I retire, but I hope to have the chance to live somewhere else at some point in my life. I have several ideas, so now I just need to sit in the chair and write. 8. Design packaging for a product sold throughout North America. Last summer, I had the opportunity to redesign the packaging used for all five flavors of Soyummi Pudding 4-packs in Canada as part of my day job, so clearly the next graphic design milestone would be to design packaging that is used throughout Canada and the US. If I do reach this goal, then my goal would, naturally, just expand to designing the packaging for other international destinations, but for now, this is a worthy goal. 9. Do one nice thing for someone else every day. This is the one thing on this bucket list that can never be fully completed. However, I hope to be able to accomplish it on a day-to-day basis, even if it’s only something as simple as placing the grocery store checkout separator on the conveyor belt for the person behind me in line. What if a terminal diagnosis led you to live your entire life as if you were dying, only to learn that you and the future had suddenly become compatible? When 16-year-old Alice receives her leukemia diagnosis, the prognosis isn’t very good. To make sure that she gets as much out of the life she still has as possible, she dedicates the rest of her life to righting wrongs anyway she can. She even convinces her friend Harvey, a guy who had a crush on her for as long as she can remember, to help her with a bucket list that’s as much about taking revenge from those who have wronged her as it is about giving hope to someone else. Unfortunately, when Alice finally settles the score, she goes into remission and has to live with the consequences of both everything she’s said and done as well as her feelings for Harvey. In Side Effects May Vary, readers are asked to question whether Alice has done irreparable damage to everyone around her, especially the person who matters most? 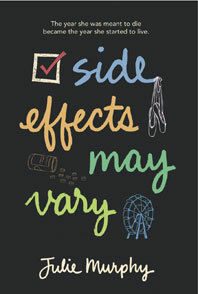 If the description of Side Effects May Vary sounds like something you’d enjoy, consider pre-ordering it now or going to your local indie bookstore on release day to pick up a copy to read. If there’s any luck in this world, then I’ll be doing the same thing.